There should probably be a monument erected in Sammy's honor, because her gradient tutorial has proved to be the easiest, most consistent gradient tutorial I've tried, and the results absolutely speak for themselves. I'm so pleased with mine! I used Caribbean (Savina) and Plum Truffle (CND) for my gradient. I really wanted to add something as a great topper, so I went with Asbestos (Windestine). It's one of my favorite glitters. I love that the glitters are all small and all the same size and color. I'll be getting a few back up bottles as soon as they come out, especially with the unbelievably professional service provided by Freda. Thank you both for a very happy pair of hands tonight! Your gradient is so pretty! I absolutely love the colors of choice! Mmm yes, just like a starry night! Very pretty! I love this, the colors look great! 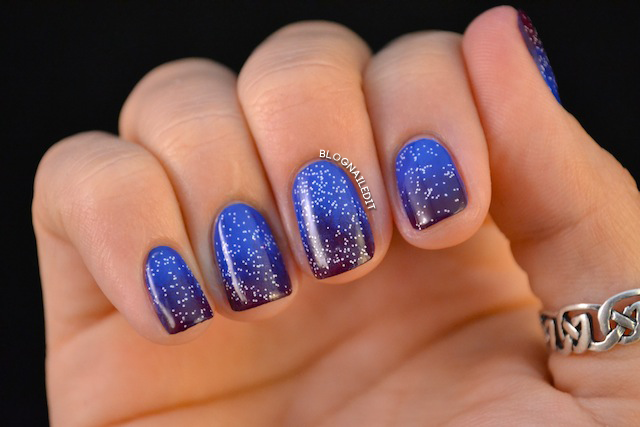 And you're right, her gradient tutorial is definitely the best one out there. I love the colours and the gradient is gorgeous! Wow, gorgeous colors together! I am a massive fan of gradient + silver glitter on top. It's like my favorite thing at the moment. I always use Kleancolors Silver Star, which has stars in it, but this is really pretty as well!!! I saw this on Pinterest before I got to it in my reader and it's already on my list of manis to try! Looks like stars in the night sky, it's very pretty! This looks so awesome!!! Love the glitter addition. I'm so into gradients right now! Love this with the white glitter over top! Love this!! The white pops perfectly on top of the dark gradient colours! And I agree, Sammy's tutorial is amazeballs!! Makes gorgeous gradients! it looks like the skyby night, very pretty!